Not the case with Zone, which can’t decide if it wants to be Sam Peckinpah or Sam Raimi. Scenes of dire emotional distress bounce willy-nilly off wacky black comedy in a manner that just doesn’t work at all. 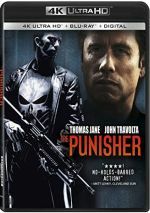 Punisher: War Zone appears in an aspect ratio of approximately 2.40:1 on this 4K UHD Disc. This became a mostly positive presentation. The image lacked jagged edges or moiré effects, and I saw no edge haloes. While not dominant, print flaws popped up a bit more than expected, as I saw a few small specks. Unsurprisingly, Zone went with a highly stylized palette that tended toward a lot of strong yellows, blues, greens and reds. These showed exaggerated tones that felt appropriate for the over the top nature of the film, and the 4K’s HDR added zest to the tones. Blacks seemed dark and deep, while shadows felt appropriate, with good definition in low-light shots. The occasional softness and specks made this a “B” presentation, but it was still appealing. Downconverted to Dolby TrueHD 7.1, I felt more pleased with the film’s Dolby Atmos soundtrack. With a fair amount of action on display, the mix used the channels in an involving manner throughout the majority of the film. How did the 4K UHD compare to the original 2009 Blu-ray? The 4K’s Atmos track added a little zing to the BD’s 7.1 mix, and visuals brought a bit of an upgrade. Whereas the BD showed crushed blacks, the 4K offered better-defined dark tones. Sharpness improved and colors showed a nice HDR boost. While not a great presentation, the 4K outdid the Blu-ray. A second disc offers a Blu-ray copy of Zone. It includes the same extras as the 4K UHD. 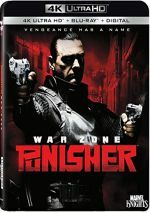 A super-violent package with little story involved, Punisher: War Zone exists mainly as 103 minutes of gore. Few positives materialize in this messy, loud experience. The 4K UHD brings generally positive visuals as well as very good audio and supplements led by a nice commentary. Zone fails become a quality action tale.